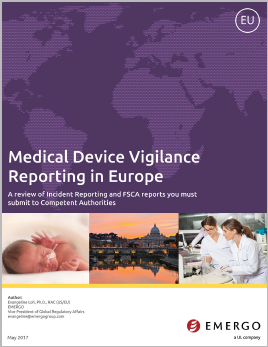 Medical device manufacturers selling in Europe are legally obligated to report adverse events, incidents, and recalls, also known as vigilance reporting. Yet European authorities suspect that underreporting is a widespread issue. You'll learn all this and more in this 7-page white paper. Evangeline Loh, Ph.D., RAC (US/EU): Evangeline is Vice President of Global Regulatory Affairs at Emergo. Evangeline’s areas of expertise include European CE Marking, clinical evaluation reports, vigilance, and device classification in markets worldwide. She previously worked for Cook Medical and holds a Ph.D. in pharmacology from The University of Texas Health Sciences Center at San Antonio.